I can often bribe my boys to stay in bed at night by promising them a special breakfast the next morning. The other night, they requested snowman chocolate chip pancakes. No problem. 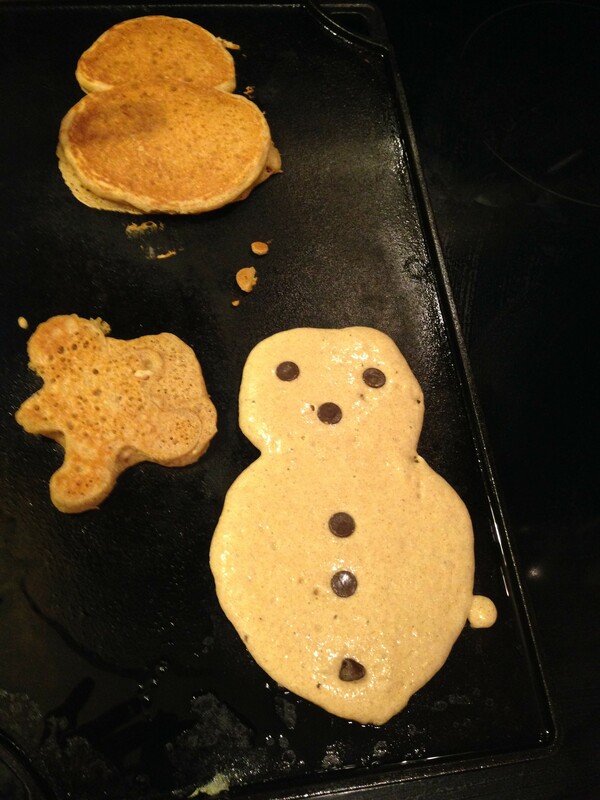 Just a slight modification on the regular pancake recipe and you’ve got snowmen – and really happy little boys. You can see in the photo, that we also gave gingerbread man shaped pancakes a shot. Eh, I prefer the snowmen. But, if you want fancier shapes, you can use metal cookie cutters to get different shapes. Just don’t overfill the cookie cutter, or you’ll get overflow that ruins your shape. Also – remember to oil the cutters before you start. For my chocolate chip pancakes, I sparingly add a few chocolate chips after I’ve poured the batter onto a hot griddle. I do the same for blueberries – you can use frozen or fresh. 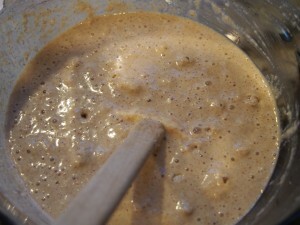 This is what your batter should look like once you’ve mixed the wet ingredients into the dry ingredients. Don’t overstir it – the lumps are okay. Just 10-15 strokes with a wooden spoon or spatula and you’ll be good. Too much stirring will make your pancakes tough. And we don’t want that. It is also a good idea to let the batter rest 5-10 minutes before you start making the pancakes. It helps to let the flour absorb some liquid and gives it more rise on the griddle. 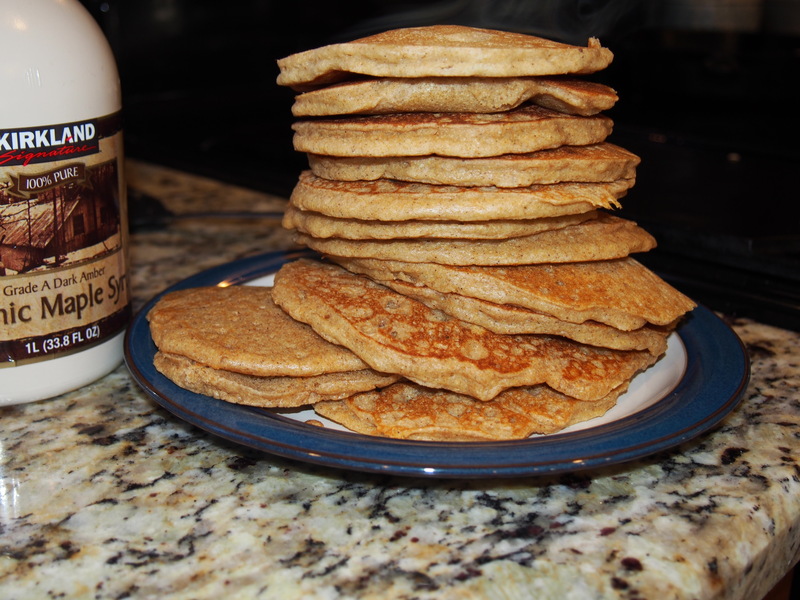 Once you have this recipe mastered, try substituting half of the whole wheat flour with buckwheat flour. It makes your pancakes so amazingly tender. Just watch out – the pancakes from I-Hop may never taste as good again. I even forgot the sugar the last time I made these, and no one noticed the difference. The cinnamon and butter gave them enough flavor – of course, the maple syrup probably didn’t hurt either. And of course, my standard disclaimer – the freshly ground whole grain flours make the difference in this recipe. 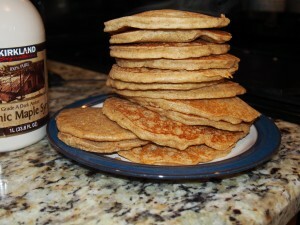 If you try this recipe with store bought whole wheat – they will be good, but not as good it can get. While preparing the batter, heat a cast iron skillet or griddle on the stovetop. Throw some bacon on there, if you want. Whisk together dry ingredients (flour through sugar) in a large bowl. Whisk egg to break the yolk and combine with buttermilk. Add egg mixture and oil to the dry ingredients. Whisk until just wet - it doesn't need to be smooth, a few lumps are okay. When the griddle is hot enough that a couple water drops dance on it, you are ready to cook your pancakes. I use a soup ladle to spoon the batter onto the griddle. This is when I add chocolate chips or blueberries to the pancakes. Flip when you see the bubbles start to pop. Cook for a minute or so on the second side until they are nicely browned. Enjoy!